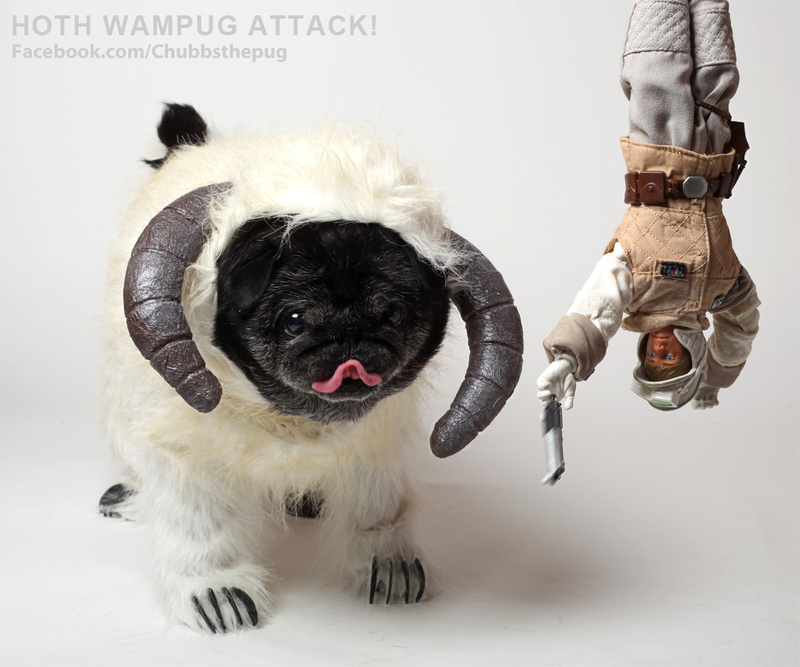 Chubbs the Wampug has made quite the splash in the Star Wars universe. With a movie, Facebook page and fans around the globe, Chubbs is one of the biggest four legged stars in the galaxy. I jumped with excitement when she agreed to give me an interview and allow her fans the chance to peek into her world. GeekMom: Thanks for taking the time out to talk with me today Chubbs. I’ve been looking forward to this for a while now. How are you doing today? Chubbs the Wampug: I’m doing great although a snackie, or two, or ten would make me feel even better! GM: I LOVE your wampug bed and outfit! Would you like to give a shout out to those who made them for you? CW: My mommy made most of my outfit although daddy did help by making the horns and assisting mom with my fittings. They both make costumes for themselves so they like to include me in the fun! 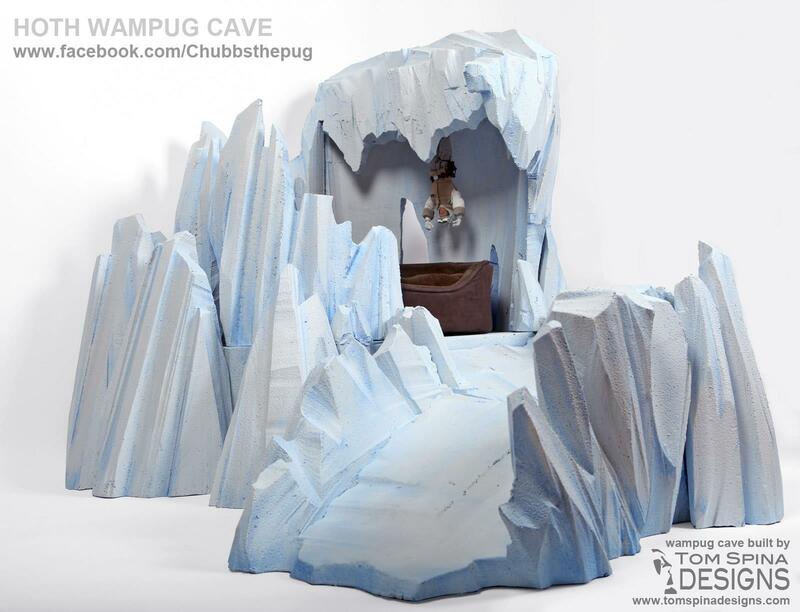 My awesome Wampug cave was made by the great people at Tom Spina Designs. It is FANTASTIC! GM: When you’re not being the Wampug, what is your favorite non-Star Wars activity? CW: It’s a toss-up between eating and sleeping, but I would have to say eating. GM: Do you have a favorite adventure that you have been on? CW: I got to go up to the mountains and in the snow for my Wampug Hoth photo-shoot and for filming of my movie The Wampug Strikes Back. I had a lot of fun doing that and it was my first time in snow like that! My Wampug costume sure came in handy to keep me warm. GM: Is there an adventure you would like to go on, but haven’t yet? CW: I think an unescorted trip to the Jimmy Dean Sausage factory would be grand! I’d also love to go pick strawberries in a strawberry patch! Yum! GM: I noticed on your Facebook that “if you are what you eat, then you’re a tater chip”. What kind of chip are you? CW: I’m a baked Lays- one taste and you’re in love. GM: We are really busy here the Florida Garrison with Star Wars Celebration VI right around the corner. Have you bought your CVI ticket yet or are you hoping to sneak in undetected in an armor bin? CW: Funny that you should mention that. There are rumors that I may have been invited and that this it is a possibility…It would involve a long plane ride and some challenges there but we’ll see how it goes. GM: Of all the pictures you’re mommy and daddy have taken, which one is your favorite? CW: Wow, that is a tough one. There are so many fun photos that we have done! Of course any that involve snackies are wonderful. But if I have to choose, I would say my Wampug Attacks photo. It captures my ferocious side while I’m still looking cute and fluffy! GM:Who do you think shot first, Han or Greedo? CW: Han of course. Even pugs know that! GM: There has been some uproar over the prequels, what do you think of them? Do you have a favorite character in any of them? GM: Last but not least, which of the Star Wars movies is your favorite? CW: The Empire Strikes Back of course! Wampas rule!! Thank’s Chubbs! You’ve been great. Tell your mommy to give you a few extra snackies for me. You’ve earned them. For more about Chubbs the Wampug and her adventures, check out her Facebook page.